This is the PSNI record of its press activity during the first two years of the investigation into the death of Baby Carrie. Police at Castlereagh are investigating the circumstances surrounding the death of a newborn baby whose body was discovered by children playing at an area known as the Duck Walk, at the rear of Lough Moss leisure centre, Carryduff, shortly after 2pm this afternoon. At this time police are concerned for the welfare of the infant's mother who may be in need of urgent medical attention. They are appealing for her to come forward. They are also appealing for anyone with information to contact detectives at Castlereagh on 028 90650222. Q - What can you tell us about the discovery of this baby's body? A - As you've just said, it was a horrific discovery by some children who found a plastic bag, earlier this afternoon, approximately 2:15pm. When they found what was in the bag, they raised the alert and since then, we've been carrying out a fairly detailed examination of the scene. Q - So, what's happening up there at the moment? A - The infant has been removed to the mortuary for post mortem examination. We have an [word missing] ongoing by trained personnel, for any further evidence that would lead us to the mother or anyone else involved in putting the child's body at this location. Q - You're particularly concerned about the health of the mother, aren't you? A - Absolutely, and in a situation like this, the mother's welfare is of paramount importance. I would say, as well as the medical aspects of child birth, being involved in a very traumatic situation like this would require very careful support and counselling. Q - So you would appeal for her, or anyone who may know her, to come forward. A - Absolutely. Anyone who knows some in this position is not doing them any favours by keeping them away from medical help. They should be encouraging someone, if they know who it is, to come forward and say that is our primary objective is to ensure the mother is alright. The investigation is very much tailored in that direction. Q - Is it possible to say, Detective Inspector, how long the baby's body had been there for? A - Indications at this time suggest two, possibly three, weeks but we're very early into the investigation at the moment. Q - Is it too early to suggest whether the child was still born or died after it was born. A - It is still too early to make that decision. A post-mortem examination has revealed the new born baby found yesterday in Carryduff had suffered a head injury. The baby girl had also suffered a number of other injuries. The body was discovered by children playing behind Lough Moss leisure centre. D/Insp Mike McErlean who is leading the enquiry said "We are still hoping that a member of the public, that a friend or a colleague, a health professional may be able to give us that lead. If it does not come very quickly, I will be starting a mass screening programme in the Carryduff area. It will start in Carryduff and radiate out from there to cover women of child bearing age, to try and find the mother of this child." Police have launched a poster campaign appealing for information on the mother, baby and subsequent murder. Detective Chief Inspector Roy McComb said: "As well as suffering horrific injuries to the baby's head, the little girl had also suffered multiple stab wounds to various parts of her body. This is information which is now prudent to release to the general public because I am very keen to appeal to the mother of the little girl to try and help her and also progress the investigation." Police have today revisited Hillsborough Road, Carryduff exactly three weeks after the body of a baby girl was found. They have been stopping vehicles near Lough Moss Leisure Centre and speaking to passers-by in the hope that someone may come forward with information about the baby's death. They are renewing their appeal for information and want to hear from anyone who can assist with the enquiry. Anyone with information should contact Detectives at Castlereagh or Crimestoppers on 0800 555 111. Detective Chief Inspector Roy McComb said: "This is a distressing and harrowing incident for all concerned and we would like to make a fresh appeal to the mother of the little girl to contact us. We are extremely concerned for her welfare, she may need counselling or medical attention. "We would welcome any contact either directly or through a third party - our prime concern now is for the mother. "Anyone who may have any information can contact detectives at the incident room on 90 259793 or call in complete confidence on the Crimestoppers number 0800 555 111." At a public meeting in Lough Moss Leisure Centre tonight D/C/I Roy Fleming said although the baby was found at Duck Walk wrapped in a plastic bag, police believe the child had been buried for a while elsewhere. There has been over 90% take up in the DNA testing. We have now tested hundreds and the number declining are in the single figures. To gain the maximum success from mass screening we require the maximum uptake. The fact that the Ombudsman is adding to the guarantee given by the PSNI that all DNA samples taken and checked against Baby Carrie and discounted will be destroyed will hopefully ensure that we get the maximum uptake. Written confirmation to the effect that the sample has been destroyed will be sent to those participating. The police commander in Castlereagh has marked today's funeral of baby Carrie by expressing his appreciation of the support for the police investigation by the people of Carryduff and the surrounding area. He said that the tragic death had in a poignant way drawn the community closer together and also renewed the appeal for information to try to identify the murdered baby's mother. Chief Superintendent Campbell Dixon, who heads up Castlereagh District Command Unit, said: "Quite simply we have been tremendously encouraged by the level of interest and support from the community in trying to help us identify the mother of baby Carrie. In a rather poignant way her tragic death has had the effect of drawing the community closer together. If you speak to local clergy of all denominations, who have been particularly supportive, this has also been their experience." Mr Dixon continued: "The investigation into the circumstances of the baby's death continues after we lay her little body to rest today. We remain totally committed to finding baby Carrie's mother and we renew our appeal to her, or to anyone who may have information that would help us to contact her. We would ask Carrie's mother to get in touch with us direct or through a third party if she feels this would make things easier." The Chief Superintendent expressed appreciation for the sensitive and supportive role played by the media throughout the police investigation and in the lead up to baby Carrie's funeral. Mr Dixon paid tribute to the Office of the Police Ombudsman for her personal intervention that did much in allaying fears concerning the provision of DNA samples. He also spoke warmly of the support received from the Mayor of Castlereagh and the Borough Council as a whole which has been fully supportive to the enquiry team and who's help in arranging today's funeral has been invaluable. Speaking of his own officers Chief Superintendent Dixon said: "I could not have had a better team to manage this enquiry. The professionalism, commitment and dedication shown throughout the police investigation by Detective Chief Inspector McComb and his team has been outstanding." Police have taken the unusual step of hand-delivering over 1,000 Christmas cards to homes in Carryduff in a fresh attempt to trace the mother of baby Carrie. Detectives say the days leading up to what would have been Carrie's first Christmas must be a particularly difficult time for her mum. The senior investigating officer, Detective Chief Inspector Roy McComb, said at a time of family reunions Carrie's mum was bound to feel the strain. "We realise that this must be a particularly emotional time for Carrie's mum who would have been about seven months' pregnant this time last year. Like any mother without her child at Christmas she must find this a very distressing experience to cope with. "We are appealing to Carrie's mum, anybody who might know her or anyone whom she may have confided in to get in contact with us. Family members or friends may remember her pregnancy this time last year. We genuinely want to give her the support she needs during these painful days." Detectives will be delivering the cards to around 1,000 randomly picked homes in the Carryduff area. DCI McComb said the tragic story of baby Carrie had drawn the entire community closer together. One detective had even come out of retirement to help out the team of officers distributing the cards, he added. "There is still tremendous community interest and support for baby Carrie. She continues to live on in people's hearts and we are as committed as ever to finding out what happened to her. That is why we have taken the unusual step of delivering Christmas cards containing this appeal for Carrie's mum to come forward. " Q - Are any results available from the 'Baby Carrie' DNA testing? A - The investigation including the testing of DNA samples is still ongoing, with no positive identification made so far. Over 1500 homes were visited, just short of 1300 DNA samples were taken and 1900 people were interviewed. An inquest has been set for Monday February 24. The Police Service of Northern Ireland would today like to thank Nuala O'Loan and all those from the Police Ombudsman's Office for their co-operation and assistance in the Baby Carrie investigation. In a bid to trace the baby's mother, detectives launched a campaign to voluntarily screen females, aged between 13 and 45, in the Carryduff area for DNA. And in an effort to give members of the public total confidence that their DNA would not be retained for any other purpose, the PSNI called in the Ombudsman's Office to oversee the destruction of all samples. Detective Chief Inspector Roy McCombe, the senior investigating officer in the case, said today: "Baby Carrie remains in the forefronts of all our minds, particularly in those of the investigating team who continue to work towards solving this tragic case. We know Baby Carrie's mother is out there somewhere and we would like to take this opportunity to re-issue our appeal for her to come forward and help put Baby Carrie finally and peacefully to rest." The Detective investigating the murder of Baby Carrie has taken the unprecedented step of writing an open letter appealing for her mother to get in touch. A year ago today, the tragic death of Baby Carrie in March last year was finally marked by a funeral in Carryduff. The senior investigating officer, Detective Chief Inspector Roy Mc Comb, said the first anniversary of baby Carrie must be particularly difficult for her mum. "We realise Carrie's mum is bound to feel distressed at this time but we feel it is a letter the mother should read. "We are still totally committed to finding baby Carrie's mother and we renew our appeal to her directly, or to anyone who may have information that would help us to contact her. We would ask Carrie's mother to get in touch with us or through a third party if she feels this would make things easier." In the run up to the second anniversary of her death detectives investigating the murder of baby Carrie are using new imaging technology to show what the little girl might have looked like had she lived. Detectives will use the photo of baby Carrie on a BBC Crimewatch appeal to be aired tomorrow night (Thursday 26th February). 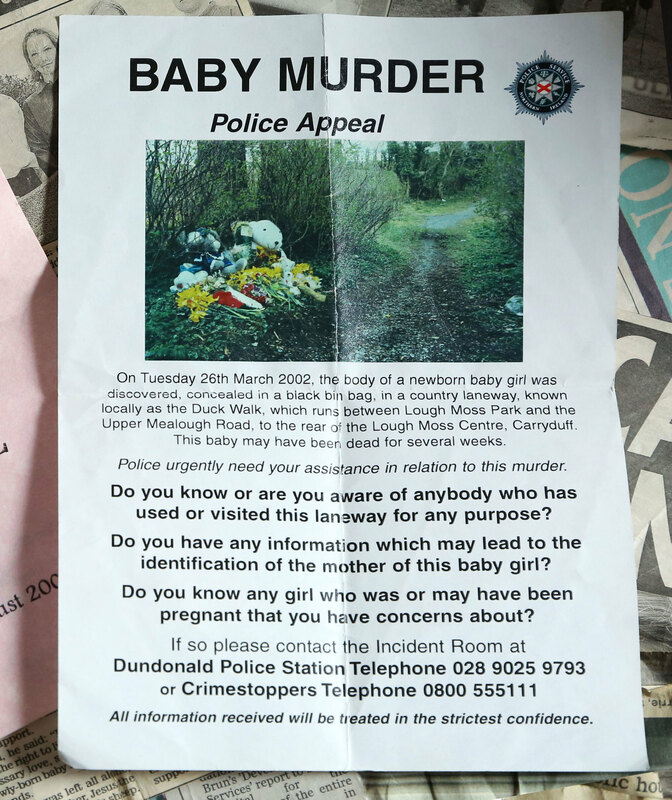 The programme reconstructs the moment on 26 March 2002 when four school children found the body of the baby at Duck Walk behind Lough Moss Leisure Centre in Carryduff. The programme follows innovations in the continuing police search for her mum. Commenting on the appeal Senior Investigating Officer Detective Chief Inspector Roy McComb said: "If she had lived Carrie would be coming up to two years old now, an energetic and playful toddler. As the anniversary of her birth and death approaches this must be a very difficult time for her mother. "The investigation into the circumstances of baby Carrie's death continues. We have always had serious concerns for the welfare of Carrie's mum and we renew our appeal to her or to anyone who may have information that would help us to contact her. 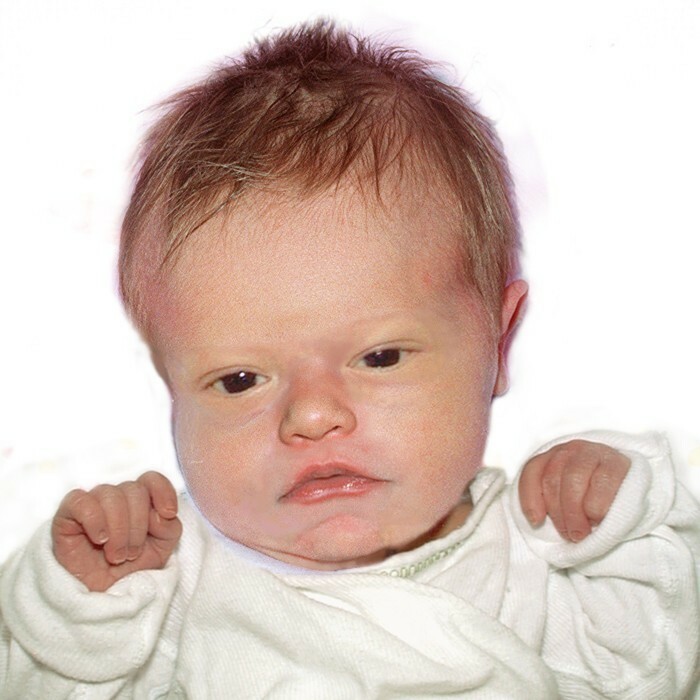 "We have now been able to use leading imaging techniques to show what Carrie might have looked liked, not as a new born infant, the age she was when she died, but as an older baby. Carrie's mum will be able to see what she might have looked like and members of the community or relatives may well recognise a family resemblance. "Somebody knows who little Carrie was and we would urge anyone with information to speak to us either by contacting police in Castlereagh on 028 90 259793 or Crimestoppers on 0800 555111." On the second anniversary of Baby Carrie's death, police in Carryduff have distributed a number of posters in the area to jog local people's memories and pledge their commitment to the investigation.